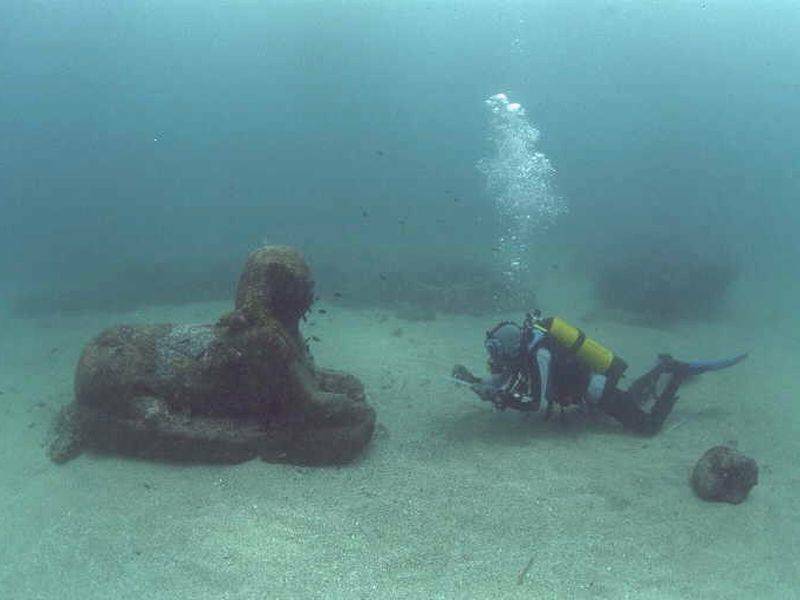 Les fouilles archéologiques sous-marines du phare d'Alexandrie se déroulent depuis les années 90, en deux campagnes annuelles de deux mois chacunes. Elles ont permis de cartographier le site sur lequel s'est effondré le phare et d'identifier certains éléments importants comme une partie de la statuaire ou la porte d'entrée du phare qui s'est brisée en plusieurs morceaux. Ce sont aussi ces fouilles qui permirent de comprendre comme le phare s'est abatue, le long de quelle ligne de secousses et dans quel ordre les pierres se sont écroulées. Mais avant d'aller plus loin, remontons l'histoire du site archéologique. ... debris, which one still sees under the waters, when the sea is perfectly calm. Since this text is true, it is easy to imagine that if the French consul could see these remains, it was also the case of the fishermen and merchants who regularly passed through the port and had to have seen the same thing. But the time was not for archaeological exploration, and as good as it was, it would not have had the means to study an underwater site. It was not until 1961 that a first serious work was done. It is the work of Kamel Abul Saadat, an amateur archaeologist who made a first study of the site which allowed to see the full extent. This study marked the Egyptian administration which initiated bail-out operations of certain pieces of the statuary of the time thanks to the buildings of the Navy. Among them was a granite colossus representing Queen Isis. With these first lifts a Scottish archaeologist, Honor Frost, came to work directly on the site. The report she gave to the Egyptian authorities concluded that these were indeed the vestiges of the lighthouse of Alexandria and insisted that a thorough study of the site should be carried out. But his appeal has remained unanswered, it is not known for what reason - officially. Perhaps it was due to the technical difficulties, scuba diving not being, at the time, as effective as nowadays. The archaeological site was therefore abandoned until 1994. 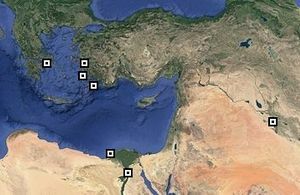 That year, serious excavations could be launched, excavations which are resumed at the rate of two two-month campaigns each year. But it was not the full will of any administrator who allowed them to be launched, but rather a contingency contest: In the early 1990s it was necessary to carry out work on Fort Qaitbay, which was beginning to need. Among the works to be done: The safeguarding of the banks by depositing on the seabed of breakwater in concrete. Of course the specialists of this work told the authorities that this was simply not possible given the bed of archaeological remains lining the bottom at this place. 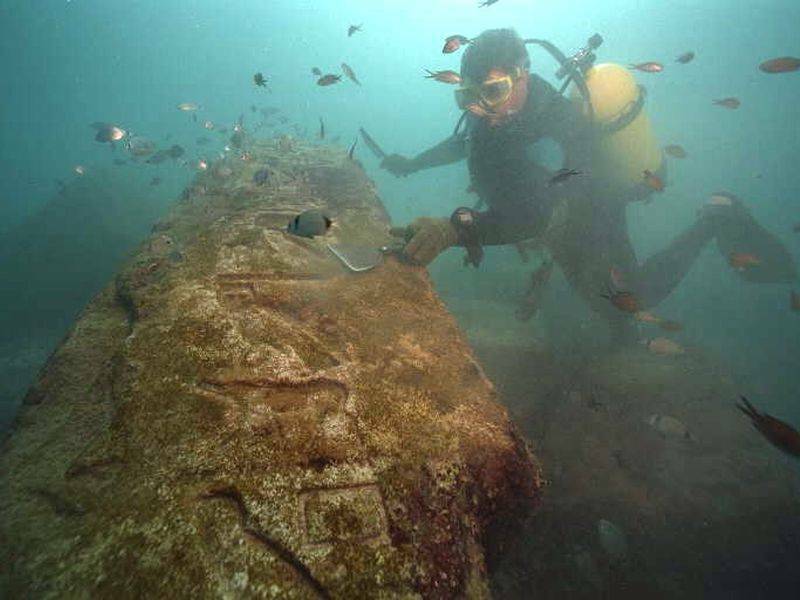 It was the starting point of the excavations, intended initially to clear the sea floor of the blocks that encumbered it. Always it is that in parallel a new tool had been created: the center of Alexandrian studies, directed by a Frenchman, Jean-Yves Empereur. The latter was able to engage in explorations under the direction of the French Institute of Eastern Archeology. These excavations were carried out according to a schedule established in advance, of course. It was first necessary to establish the boundaries of the research site, which was established on an area of ​​1.3 hectares. Then began the mapping phase. It is a long task to locate each block. When we say "to locate", it means to indicate on a plane the exact coordinates, the position, the inclination, and then to identify the material (granite, limestone, etc), shape, dimensions, make a drawing, or even photograph it. Each block requires a cleaning of the block, which is quite time consuming. In July 20015 there were 2843 identified blocks. Then the next job is to establish series. A series is a sequence of blocks having a link between them. This is done in two steps, first by listing each block on cards and then analyzing their positions and characteristics. Thus, groups of blocks can be constructed which can be grouped together until the maximum possible reconstruction. The study of these elements proves that reuse was a common practice at the time, the elements of ancient Egypt were used on buildings of the Hellenic period. The monumental gate is an example of the usefulness of this work, since its reconstruction is identical to the written testimonies of observers, centuries later. This gate is interesting because its monolithic architecture is a legacy of ancient Egyptian constructions but its decor is Greek style, which is consistent with the puic history the lighthouse was built on a territory that had become a Greek province a few decades before. The mapping was carried out using traditional methods such as triangulation, but also by adaptations of systems used in terrestrial contexts such as metal grids or photographic surveys using markings marked on the ground. We also conducted surveys in direct topography using a tachymeter, which measures angles and distances, and a buoy connected to a pig underwater manipulated by a diver. Since September 2001, CEAlex has further refined its tracking system through the use of a apparatus using an acoustic system. The measurements of angles and distances carried out directly under water are stored in a pointer which records the information which is returned to it by an origin base of the Cartesian coordinate system. The points are then unloaded on the computer thanks to a computer interface which automatically restores the plan raised during the morning. The succession of stages is essential in this context of particularly aggressive immersion. Indeed, open to the north and west on the open sea, the site undergoes, after each period of bad weather, modifications of its configuration that only a methodical work allows to disentangle. Our interventions, which are nevertheless necessary for study, are sometimes responsible for these disorders, since they disturb the stability acquired in the face of natural elements. This phenomenon has been observed in some particularly exposed areas of the site where the accumulation of archaeological pieces on several levels requires the displacement of the upper layers in order to reach the hidden blocks. In other places, disorders are caused by the collapse of overhanging parts of the trays where the antique pieces rest; this gives an idea of ​​the changes that relief has undergone since antiquity. The detailed drawings of the blocks, which permit the restoration of monuments or parts of monuments, require special care. Upstream of this work, as for the exercises of sketching or molding of inscriptions and decorations, there is a thorough cleaning of the block. Underwater, the stones are covered with an animal and vegetable concretion several centimeters thick, which must be removed with a metal scraper in order to reach the surface to be observed. The time spent on the drawings is further increased by a generally bad visibility due to pollution, by a sea often agitated and by difficult access to all the faces of a block, which necessitates lifting procedures. Note: This paragraph is a reprise of the book of J.-Y. Empereur, Alexandrie redécouverte, Stock, 1998.